After being a terrible strategy in 2015, Canadian investors did well to stay at home in 1Q16. In 2015, the major forces driving markets were the plunge in crude oil prices and the monetary policy divergences between the US Fed, which announced its intention raise its policy rate, and other major central banks, including the Bank of Canada, which were expected to ease monetary policy in response to weak growth and below target inflation. These forces shifted in 1Q16. The price of WTI crude oil, which began 1Q16 at US$37 per barrel, touched a 12-year low of just over US$26/bbl on February 11, but then rallied back to finish the quarter at US$38/bbl. The rally in crude oil was triggered by two factors. First, the market perceived, and the Fed confirmed, that it would move more gradually to raise its policy rate. This led to profit-taking on long-USD positions and sent the US dollar index (DXY) down by 5% from its late-January high to its March 31 low. The weaker USD, combined with an agreement between Russia and Saudi Arabia to cap oil production at current levels, helped boost crude oil and other commodity prices. On the monetary policy front, in 2015, as the Fed promised that it would raise the fed funds rate, market participants viewed the Bank of Canada as one of the group of central banks that were expected to ease policy further. However, while the central banks of Japan, the Eurozone, China, Sweden, Norway and New Zealand did ease further in 1Q16, the BoC failed to validate the market's expectation of further easing, deciding to defer any further action until after the federal budget provided details of the new Liberal government's promised fiscal stimulus. The BoC decision to stand pat, combined with the Fed backing off on tightening, sparked a 12% rally in the Canadian dollar from the January 19 low of 68.6 US cents to the March 31 high of 77 cents. This 12% rally was hard on unhedged Canadian portfolios with substantial global exposures. For example, as the Fed signalled a more gradual pace of tightening, the S&P500 ETF (SPY) reversed its early January losses: it gained 10% in USD terms from January 15 to March 31, but lost 1.5% in CAD terms. Similarly, the US 10-20 year Treasury bond ETF (TLH) gained 3% in USD terms over the same period, but lost 7.8% in CAD terms. As a result of the sharp C$ appreciation, all of the unhedged Global ETF portfolios that I track in this blog posted losses for 1Q16. Meanwhile, a stay-at-home 60/40 investor who invested 60% of their funds in a Canadian stock ETF (XIU), 30% in a Canadian bond ETF (XBB), and 10% in a Canadian real return bond ETF (XRB) had a total return (including reinvested dividend and interest payments) of 2.6% in Canadian dollars. This was a partial reversal of the 3.0% loss posted by the all-Canada portfolio in 2015. 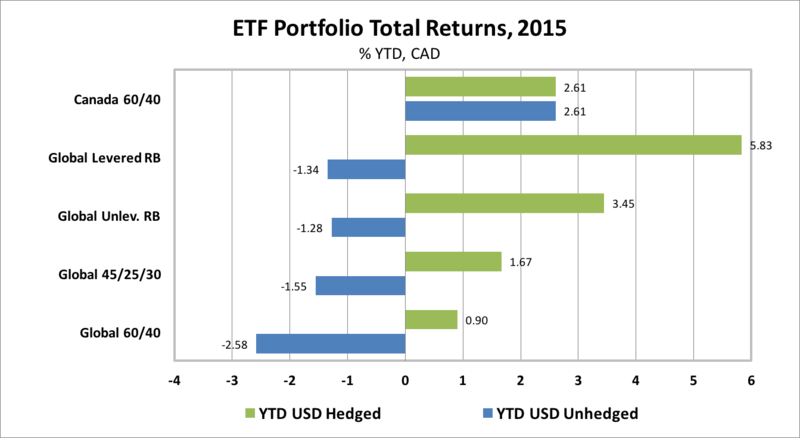 Since we began monitoring at the beginning of 2012, we have found that the unhedged Global ETF portfolios have vastly outperformed the stay-at-home portfolio. However, as you will see in this post, that behaviour reversed in 1Q16. In 1Q16, with the USD depreciating 6% against the CAD (after appreciating 19% in 2015), the best performing global ETFs in CAD terms were an unlikely trio: gold, local currency emerging market bonds and Canadian equities. The worst ETF returns were in the Japanese and Eurozone equities and commodities. The chart below shows 1Q16 returns, including reinvested dividends, for the ETFs tracked in this blog, in both USD terms and CAD terms. 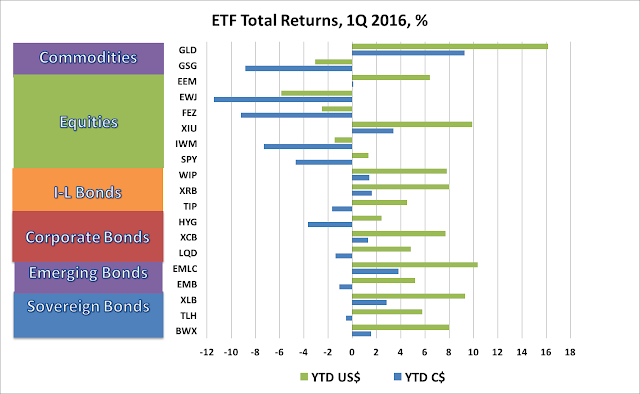 Global ETF returns varied widely across the different asset classes in 1Q16. In USD terms, 14 of the 19 ETFs we track posted positive returns, while 5 ETFs posted losses for the quarter. However, just 9 of the 19 ETFs posted gains in CAD terms, while 10 posted losses. The best gain was in the Gold ETF (GLD) which returned 9.3% in CAD terms. The Emerging Market Local Currency bond ETF (EMLC) returned 3.8%, while the Canadian equity ETF (XIU) returned 3.4% in CAD terms. Other ETFs with positive returns for the quarter included Canadian Long Bonds (XLB) 2.8%; Canadian real return bonds (XRB) 1.6%; non-US sovereign government bonds (BWX) 1.6%; non-US inflation-linked bonds (WIP) 1.4%; Canadian corporate bonds (XCB) 1.3%; and the emerging market equity ETF (EEM) 0.1% in CAD terms. The worst performers, were the Japanese equity ETF (EWJ) and the Eurozone equity ETF (FEZ), which returned -11.4% and -9.2%, respectively in CAD terms. Other ETFs posting sizeable negative returns in CAD terms were the commodity ETF (GSG) -8.8%; US small cap stocks (IWM) -7.3%; the S&P500 ETF (SPY) -4.7%; the US high yield bond ETF (HYG) -3.7%; US inflation-linked bonds (TIP) -1.7%; and US Investment Grade Bonds (LQD) -1.4%. In 1Q16, the Global ETF portfolios tracked in this blog all posted negative returns in CAD terms when USD currency exposure was left unhedged. However, if the USD currency exposure was hedged, all of these portfolios would have realized positive returns. A stay-at-home, Canada only 60% equity/40% Bond Portfolio returned 2.6%, as mentioned at the top of this post. Among the global ETF portfolios that we track, the Global 60% Equity/40% Bond ETF Portfolio (including both Canadian and global equity and bond ETFs) returned -2.6% in CAD terms when USD exposure was left unhedged, but +0.9% if the USD exposure was hedged. A less volatile portfolio for cautious investors, the Global 45/25/30, comprised of 45% global equities, 25% government and corporate bonds and 30% cash, lost 1.6% if unhedged, but gained 1.7% if USD hedged. Risk balanced portfolios underperformed in 1Q16 if unhedged, but outperformed if hedged (the reverse of their performance in 2015). A Global Levered Risk Balanced (RB) Portfolio, which uses leverage to balance the expected risk contribution from the Global Market ETFs, lost 1.3% in CAD terms if USD-unhedged, but had the biggest gain of +5.8% if USD-hedged, benefitting from strong levered bond returns in USD terms. An Unlevered Global Risk Balanced (RB) Portfolio, which has less exposure to government bonds, inflation-linked bonds and commodities but more exposure to corporate credit, lost1.3% if USD-unhedged, but gained 3.5% if USD-hedged. In my view, the key market events of 1Q16 that influenced global ETF portfolio returns in CAD terms were: the Fed's shift to a less aggressive tightening stance; the BoC's decision to defer further easing; and the agreement between the Russians and the Saudis to cap oil production at current high levels. As we look ahead, it is fair to say that prospective returns on these portfolios will depend on how views on monetary policies and crude oil prices evolve in the coming months. Recent economic data suggest that 1Q16 real GDP growth will turn out to be stronger than expected in Canada and weaker than expected in the US. It should be noted however that US economic data is more timely than Canadian data. Early indications for 1Q16, based on the Atlanta Fed's GDP Now forecast, pointed to close to 3% growth for US real GDP, but that estimate has now been cut to 0.7%. Similarly, recent upward revisions to 1Q16 growth forecasts to 3% for Canada have been heavily influenced by a strong gain in January GDP. It would not be surprising if these expectations are tempered somewhat, just as US forecasts have been cut as more current data has been released. Nevertheless, the combination of the bounce in Canada's GDP combined with substantial increases in government spending contained in the federal budget, will likely keep the Bank of Canada on hold for some time. Meanwhile, Fed Chair Janet Yellen's message has been clear that the Fed will proceed cautiously with tightening, so the shift in monetary policy expectations that occurred in 1Q16 is likely to persist. A sharp decline in worldwide oil and gas exploration and development spending suggests that crude oil production growth will slow, perhaps bringing global oil demand and supply into better balance as 2016 unfolds. While crude oil prices have come off their late March highs, they are unlikely to dip back below US$30/bbl any time soon. This leaves markets in a similar position to where they were at the beginning of 2016. Both equity and bond market valuations remain stretched. Global growth remains sluggish. Deflationary forces remain strong. China's credit growth remains worrisome. Geo-political risks remain elevated. As I wrote three months ago, "in a continuing uncertain environment, characterized by significant global divergences in growth and central bank policies, and depressed oil and other commodity prices, remaining well diversified across asset classes, with substantial exposure to USD-denominated assets and with an ample cash position continues to be a prudent strategy". While this strategy generated modest losses in 1Q16 as the Canadian dollar surged, it still seems prudent to me.